Gogotsi, a professor in Drexel’s College of Engineering and director of the A.J. Drexel Nanotechnology Institute, teamed with Mathieu Salanne, C?line Merlet and Benjamin Rotenberg from the Universit? Paris, Paul Madden from Oxford Univ. and Patrice Simon and Pierre-Louis Taberna of Universit? Paul Sabatier. What the group has produced is the first quantitative picture of the structure of ionic liquid absorbed inside disordered microporous carbon electrodes in supercapacitors. Supercapacitors have the capability of storing and delivering more power than batteries; moreover, they can last for up to a million of charge-discharge cycles. These characteristics are significant because of the intermittent nature of renewable energy production. The figure above (Molecular Dynamics simulations by the group of Mathieu Salanne): shows ionic liquid surrounded by two porous carbon electrodes. It explains how the positive (red) and negative (green) ions interact with the carbon surface. The charging mechanism involves the exchange of ions between the bulk and the electrode. This simulation yields much higher capacitance values than in models using simplified regular electrode geometries. Image: Drexel Univ. According to the researchers, the excellent performance of supercapacitors is due to ion adsorption in porous carbon electrodes. 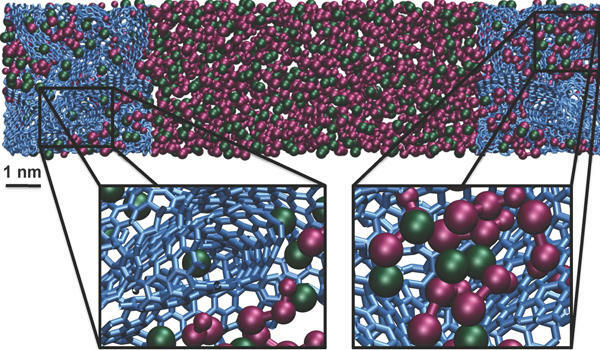 The molecular mechanism of ion behavior in pores smaller than one nanometer-one billionth of a meter- remains poorly understood. The mechanism proposed in this research opens the door for the design of materials with improved energy storage capabilities. he authors suggest that in order to build higher-performance materials, researchers should know whether the increase in energy storage is due to only a large surface area or if the pore size and geometry also play a role. The results of this study provide guidance for development of better electrical energy storage devices that will ultimately enable wide utilization of renewable energy sources. This international collaboration is exemplified in the Master Program in Materials for Energy Storage and Conversion (MESC) offered jointly by Universities in France, Poland, Spain, China and the US (Drexel Univ. ), in which students spent four semesters studying in at least three different countries and obtaining important international experience, in addition to knowledge in the energy field. Currently, 3 MESC students perform their master thesis research at Drexel.